Cape Town advocate Donald Ackerman persists with his garagiste winemaking endeavours under his Flying Cloud label (after a renowned 19th century clipper ship) and currently has two 2015s available. W.O. Elim. 60% Sauvignon Blanc, 40% Semillon, fermented and matured for 10 months in barrel. The nose shows fynbos and nettles before lime, cucumber, white peach and a hint of blackcurrant. The palate shows pure fruit and very fresh acidity before a salty finish. 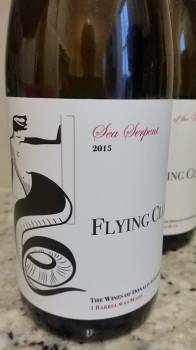 It’s a striking wine – quite lean with a sort of “sour worm” character to it. W.O. Elim. 100% Syrah, matured for 15 months in a third-fill 300-litre barrel. A nose of great typicity with notes of red and black berries, white pepper plus some fynbos and some floral perfume. The palate is light and fresh yet flavourful – well delineated fruit and nicely grippy tannins, the finish again possessing a salty quality. Deftly handled.